Turn on the flame and put the milk pan on it, let the milk boil. Simmer the flame, add sugar and stir it. Boil the milk on low-medium flame till its reduces to 1/4 of its original quantity (keep stirring in between). 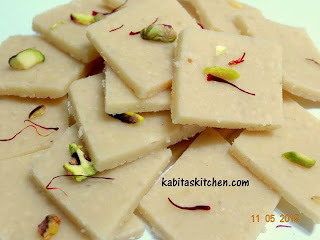 Crush the caramel toffee( do not make too small pcs) and mix it in prepared malai. 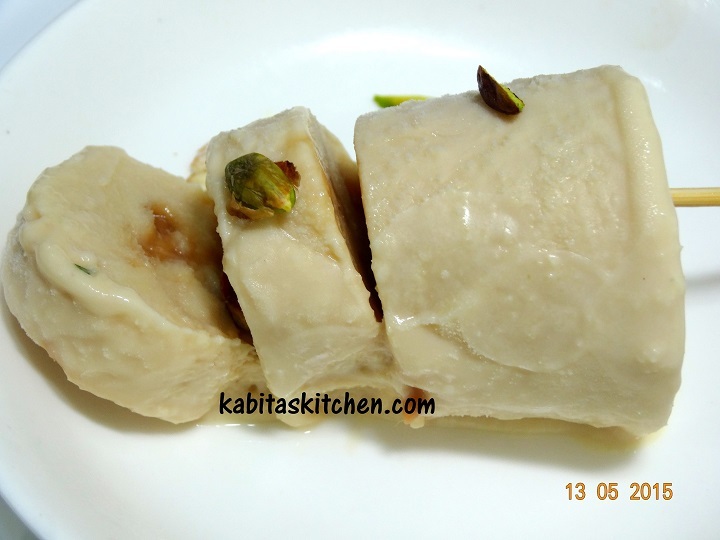 Fill the prepared mixture in the kulfi maker and put it in freezer for 6-8 hours. Take out from freezer and ready to serve. Soak the rajma overnight and boil it for two whistle with 2 glass of water, 1/2 tsp salt and 1/2 tsp turmeric powder in a pressure cooker on medium flame. Separate the water from boiled rajma (keep the boiled rajma water for further use). Heat a pan, add cooking oil and let the oil heat properly. Add hing and cumin seeds into the hot oil, fry it for few seconds. Add grated ginger and garlic and fry it for 30 seconds. Add turmeric powder and red chilli powder and mix it. Add onion paste and fry it for a minute on medium flame. Add tomato puree, mix it and cook it for 2 minutes on low flame. Add cumin powder, coriander powder and black pepper powder, mix it properly with masala paste. Cover it and cook it for a minute on low flame, keep stirring in between. Fry the masala paste till oil is separated from the masala. 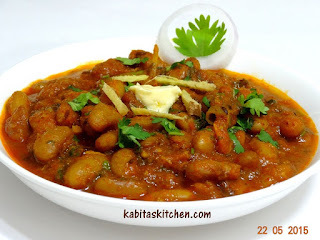 Increase the flame to high and add rajma stock (boiled rajma water). Add 1/2 cup of water and stir it. Add chopped green chilli, chopped ginger and boiled rajma into the pan. Add salt to taste(I had already added salt while boiling rajma). Cover the pan and cook it for 2-3 minutes on medium flame. Add garam masala powder, chopped coriander leaves and butter and turn off the flame. Serve in a plate, Garnish with coriander leaves, onion rings and butter. Ready to serve with plain steam rice, jeera rice or pulao. Peel the mango and chop it into pieces, discard the seed. Put all the ingredients into blending jar and blend it without water for 5-7 seconds. Add little water and grind it again till it turns into smooth thick paste. Serve fresh or keep in refrigerator and consume it within 2 days. 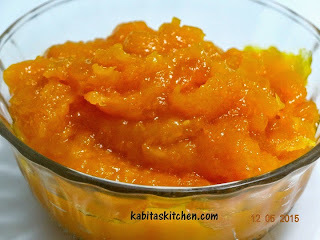 Wash the mango properly and boil it with 3 cups of water in pressure cooker for one whistle . Allow it to cool down, drain the water and keep the water aside for further use. Peel the boiled mango, separate the pulp in a bowl. In a blending jar: add mango pulp, sugar, mint leaves, lemon juice, salt, black salt, roasted cumin powder and ice cubes. Blend it into thick smooth juice, transfer the liquid into a jar. You may consume it immediately (recommended) or preserve and use it for upto 2-3 days. Serving:Take a glass, add few ice cubes and black salt into the glass. Fill 1/2 of the glass with prepared panna and dilute with chilled water as per your taste. Decorate with mint leaves and serve chilled. Heat a non-stick pan, roast all the whole spices on low flame for 2 minutes. Turn off the flame when the spices starts to change the colour, let the spices cool down little bit. Put it into the blending jar, grind it into powder and keep it aside. Heat a pan, add cooking oil and let the oil heat. Add chopped garlic and ginger and fry it for few seconds. Add chopped onion, fry the onions on medium flame till it turns little soft. Add chopped tomato and fry the tomato till it turns soft, add little salt to cook the tomato faster. 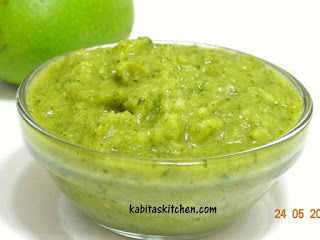 Put it into the blending jar and blend it into paste (do not add water). Heat the same pan, add oil and let it heat. Add green chill, onions(chopped in square shape), capsicum (chopped in square shape) into the hot oil. Fry the chopped onions and chopped capsicums on high flame for a minute. Simmer the flame to medium, add red chilli powder and turmeric powder into the hot oil. Add the prepared masala paste, fry the masala for a minute on medium flame. Add the roasted masala powder, mix it and fry it for another minute. Add cream (whisk it before use) and mix it properly into the fried masala paste. Add 1/2 glass of water and stir it properly. 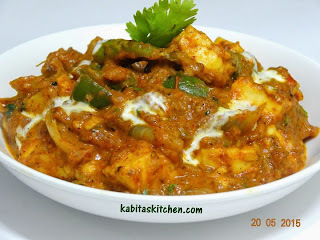 Add paneer and salt to taste(we already used little salt at the time of onion, tomato fry). Add garam masala powder, mix it and cook it for 2 minutes on low flame. Add chopped coriander leaves and turn off the flame. 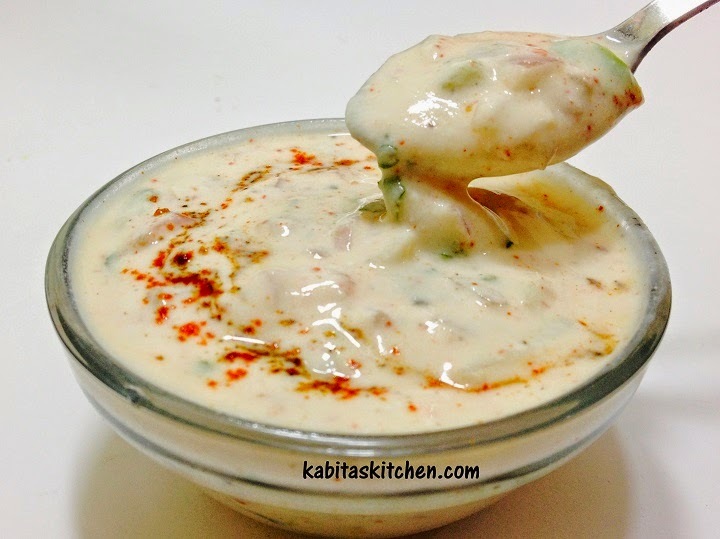 Garnish with coriander leaves and fresh cream and ready to serve. Prick the boiled potatoes with fork, add little red chilli powder, turmeric powder and salt into it. Mix it properly and shallow fry it on medium heat for 2-3 minutes (keep it aside). Heat a pan, add 2 tbsp oil into the pan and let the oil heat. Add whole garam masala and fry it for 5-7 seconds, add cashew nut and fry it for 10 seconds. Add chopped ginger and garlic in pan and fry it for a minute. Add chopped onion and fry it till it turns little soft. Turn off the flame, let the fried ingredients cool down. 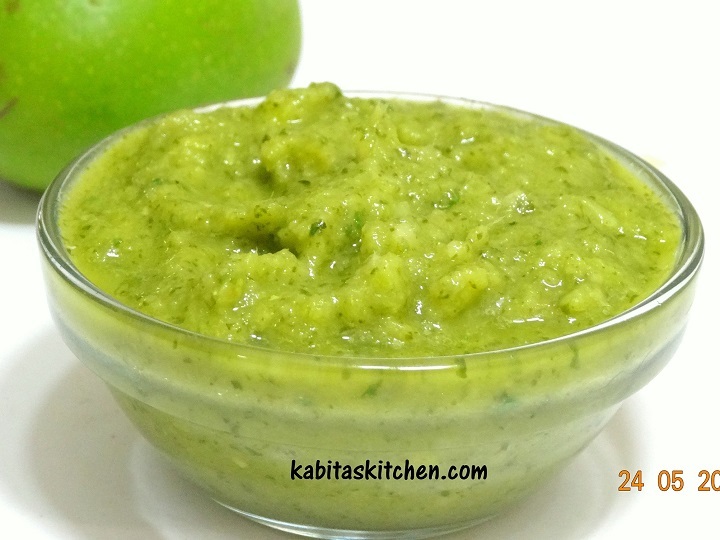 Take out in a blending jar and blend it into thick smooth paste (do not add water). Once the oil is heated, add cumin seeds and let it splutter. Add red chilli powder and turmeric powder into the hot oil for nice and rich colour of gravy. Add the masala paste and fry it with red chilli and turmeric powder for 1-2 minute on medium flame. Add coriander powder, cumin powder and black pepper powder into the masala paste, mix it. Mix it properly and fry the masala till the oil is separated from the masala paste. Add tomato puree, mix it and cook it for 2 minutes on low flame (cover the pan). Add curd (simmer the flame before puting it in the pan), stir it continuously. Fry the masala on low flame for one more minute, add one glass of water and stir. Add garam masala powder add salt to taste ( I had already added salt in the potato). Crush the kashuri methi on your palm and put in the gravy, stir it. Add the fried potatoes into the gravy, mix it, cover the pan and let the gravy come to boil. Add coriander leaves and turn off the flame. Ready to serve with roti, rice and pulao etc. Peel the mango and chop it (discard the seed). Blend the chopped mango into puree (do not add water). Turn on the flame and put a pan over it. Add the mango puree into the pan, stir it and let it come to boil(cook on medium-high flame). Simmer the flame to low-medium, add sugar and lemon juice, stir it. Cook it for 2-3 minutes on low -medium heat, make sure sugar is dissolved properly. Simmer the heat to low flame, cook it for another 5-6 minutes (keep stirring). Store in a clean and dry jar, keep refrigerated and use it within a week. Whisk the curd well, add all the chopped vegetables and mix it. Add all the spices and salt into it, mix it properly. Sprinkle some roasted masala powder and ready to serve. Add saffron and chopped dry fruits into the prepared malai and mix it. 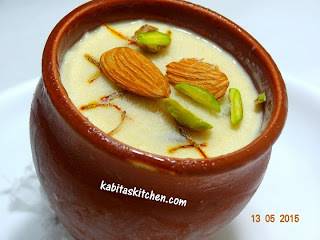 Take kulhar or matka, fill the pot with prepared malai in it, Sprinkle few saffron threads on it. Cover it with foil paper, Put it in freezer for 6-8 hours. Take out from freezer, garnish with chopped pistachio and almond. Note: You may add the dry fruits and saffron at the time of milk boiling process. Put the cashew nuts into the blending jar and grind it into powder. Do not blend it in one go, blend it for 5 seconds then mix it with spoon (repeat blending and mixing 2 times). Turn on the flame, put a pan over it, add sugar and water together into the pan. Let the sugar come to boil, add saffron into the sugar syrup and stir it. Once sugar is dissolved, add cashew powder and stir continuously. Cook it for 3-4 minutes on low flame, keep stirring. Once the cashew paste starts separating from the pan, cook it for another minute (keep stirring). Turn off the flame, keep stirring for another 30 more seconds. Grease a plate with ghee, pour the prepared cashew paste in the plate. Allow it to cool down little bit, keep mixing it with spoon to avoid lumps while its cooling down. Start kneading the dough when it is little cold (ensure that its not too hot, it may cause burns if too hot). Apply some ghee to make the dough smooth, knead the dough for 2-3 minutes. Place butter paper on the the board, put the dough on butter paper and apply little ghee on it. Place the another butter paper over it and roll it with rolling pin evenly. Cut the edges of the flattened cashew dough then cut it into diamond shape. Kaju katli is ready, serve it fresh. Peel the bottle gourd/ lauki and cut into round slices. 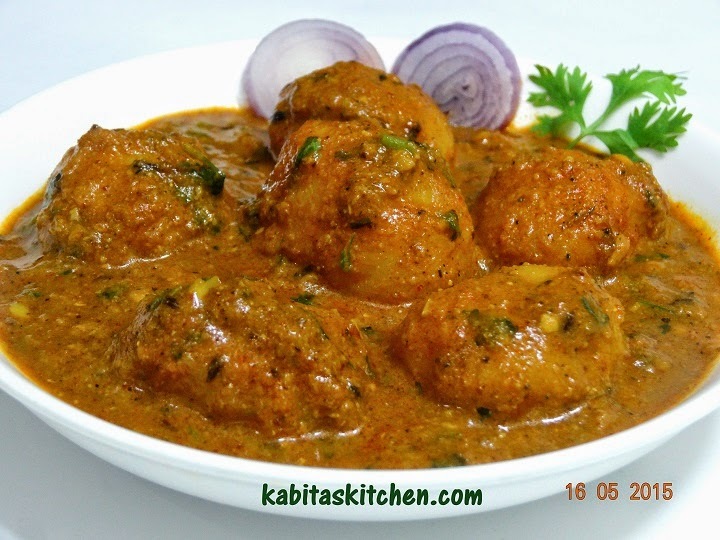 In a bowl: add gram flour, rice flour, spices, salt and crushed garlic, mix it. Add little water, mix it well to make smooth thick batter. Heat oil in a pan to deep fry the pakora. Coat the lauki/ bottle gourd slices with the prepared batter and gently put it in the hot oil one by one. 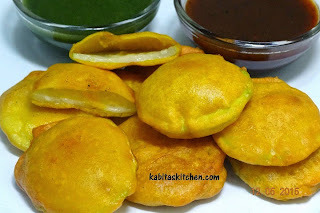 Fry the pakora from both side till it turns golden brown. Take out on the kitchen towel to absorb extra oil from it. Once the pan is heated, add cooking oil and let it heat. Add cumin seeds, green chilli, chopped garlic into the oil and fry it for 20 seconds. Add turmeric powder and red chilli powder into the oil and mix it. 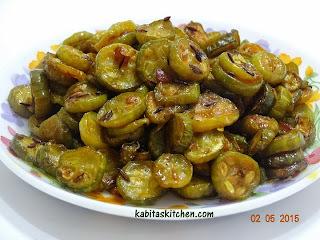 Add chopped tindora/ ivy gourd into the pan and mix it. Cover the pan, cook it for 4-5 minutes on medium heat. Open the cover, stir and add cumin powder and salt to taste. Mix it properly, cover the pan and cook it for 5-7 minute on low flame. Open the cover, increase the flame to high and fry it for a minute to make it crispy. Turn of the flame, ready to serve with roti, paratha or puri. Soak the soya chunks into the hot water for 10 minutes, drain the water and squeeze the chunks properly. Put the soya chunks into the grinding jar and coarsely grind it (do not make paste). Transfer the grounded soya into a big bowl and add all the ingredients except cooking oil. Mix and mash it for a minute, make equal size of balls of the mixture. Take any shape of cookies cutter for designer kebabs (you may make it simple round shape). Apply few drops of water on your hand and shape the mixture in flat round kebab shape. Repeat the process to make the remaining kebabs. Heat little oil in a flat pan, once the oil is heated, simmer the flame. Put the prepared kebabs into the pan one by one, fry it for a minute then flip it to fry other side. Fry it from both sides on low heat till it turns golden brown. Garnish with onion rings, lemon wedges and serve hot with Green Mint chutney. Add 4 tbsp water into the sugar to dissolve it, stir and keep it aside. 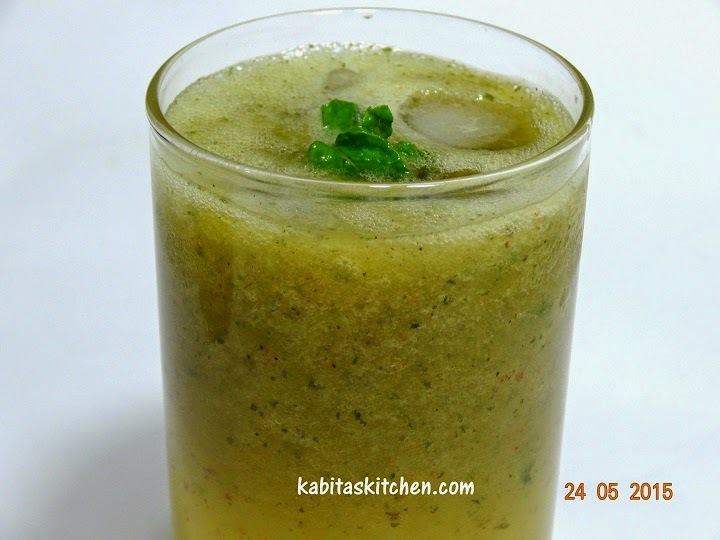 Put 2/3 portion of mint leave and little water into a steel glass and make mint juice using hand blender (do not make paste). Take the serving glass, put some mint leaves on the base of glass. 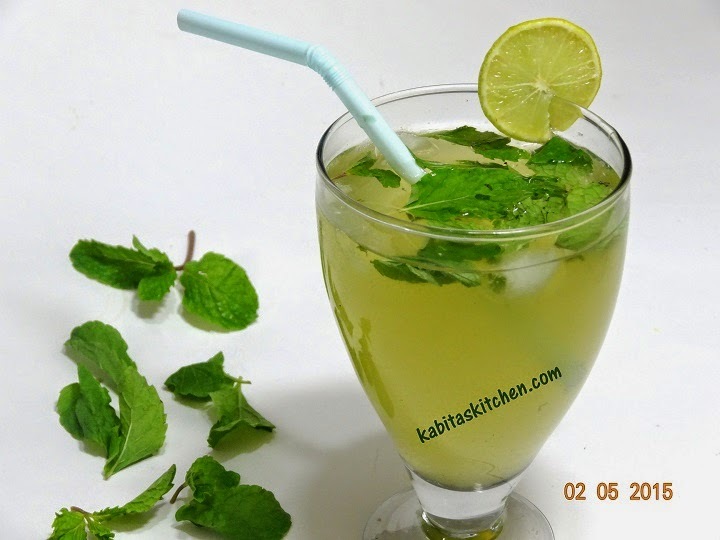 Filter the mint leave juice into the glass using tea stainer. Add 2-3 ice cubes, sugar syrup, lemon juice and little salt into it. Add chilled soda water and little water and stir it. Decorate with lemon slice and serve chilled. NOTE:For sharbat, replace the soda water with plain water. Add curd, red chilli powder, turmeric powder, shahi biryani masala powder, chicken masala powder, green chilli, 1/3 cup coriander leaves and 1/4 cup of mint leaves into the chicken. Add 6 green cardamom(crushed), 3 black cardamom(crushed), 1 javitri, 1 inch cinnamon stick and 4 cloves. Mix it properly and keep it in refrigerator for an hour for marination. Heat oil, deep fry the finely chopped onions till it turns golden brown. Take out the fried onion on the kitchen towel to absorb extra oil. Put 2.5 litre of water in a pan, let it come to boil. Add washed rice, 1 tsp ghee, 4 green cardamom, 3 black cardamom, 1 javitri, 1 inch cinnamon stick , 1/2 tsp salt into the rice. Mix it gently, cover the pan and let it come to boil. When the rice starts boiling, check the rice, it should be 50-60% cooked. Turn off the flame and drain the rice properly (you may remove the whole spices). Take out the marinated chicken from the refrigerator. Take a deep and thick pan, put the marinated chicken on the base of the pan. Put 1/3 of the fried onion on it, spread it evenly. Add little coriander leaves, mint leaves and 1 tbsp ghee on the onion. Put 1/2 of the half-cooked rice on it, spread it evenly. Add 1/3 (half of the remaining fried onion) of the fried onion, coriander leaves, mint leaves and ghee again to make second layer. Put the remaining rice on it, add saffron soaked milk on the half part of the rice. 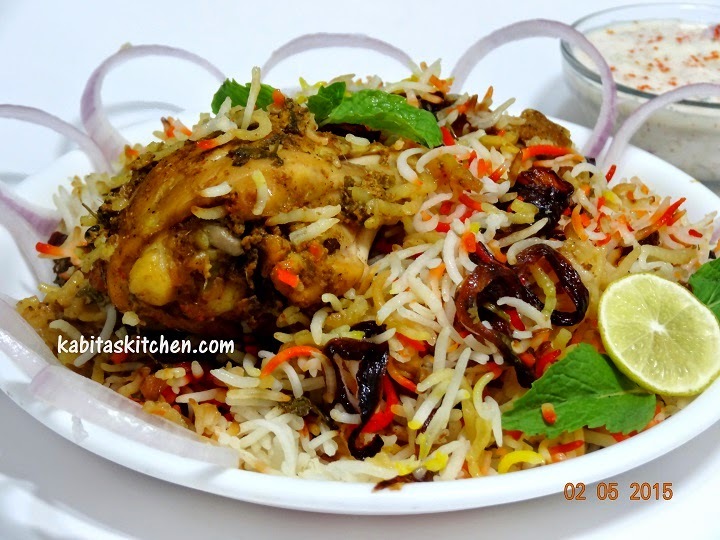 Add 2 tsp food colour on the other part of rice ( you may add kewra water and rose water for restaurant style aroma). 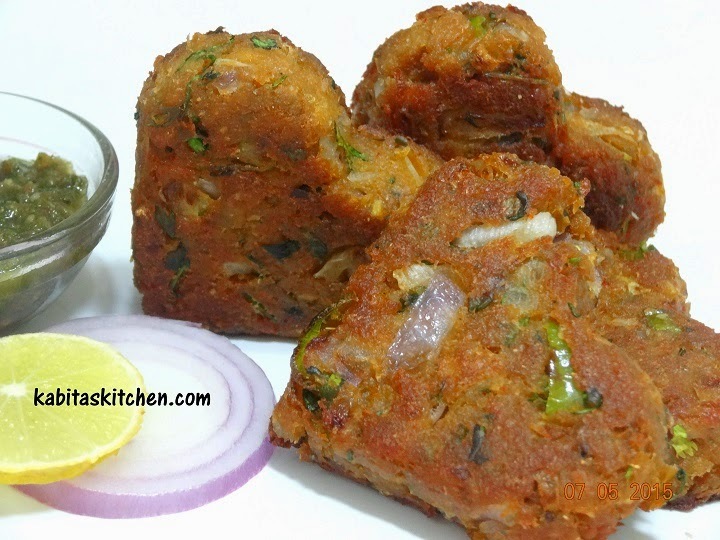 Sprinkle remaining fried onion, coriander leaves and mint leaves on it. Spread 1 tbsp ghee again and cover the pan. Make a stiff dough of wheat flour to seal the edges of biryani pot (you may use foil paper to cover the pan). Seal the edges of the pot, seal it properly so that steam does not come out when we cook it. Turn on the flame and reduce the flame to medium, put the sealed biryani pot on the flame. Cook it for 20 minutes on low-medium flame then reduce the flame to low. Cook it for 15 minutes on low flam. Turn on the other flame and heat a tawa, once the tawa is heated, transfer the biryani pot on it. Cook it on tawa for 15 minutes(first 7 minutes on medium flame and rest 8 minutes on low flame). Turn off the flame and keep it aside. Cut the edges of dough carefully, do it very carefully to avoid the burn from the steam. Serve in a plate, garnish with onion and lemon slices. Ready to eat with raita or mirchi ka salan.